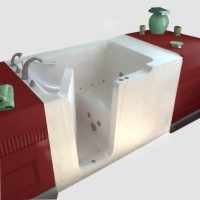 The Super-Size Walk-In Tub from Sanctuary is the most ample tub we offer. It is constructed of easy to clean reinforced fiberglass and includes standard Sanctuary features such as a stainless steel frame, low step in height, inward swinging door, and adjustable leveling feet that make installation and use safe and easy. Best Feature: The Super Size is the largest Sanctuary walk-in tub and provides ample bathing room for nearly any person. Our Recommendation: The Super Size is what you need if you want as much room as possible, but be aware that it can take some time to fill a walk-in tub of this capacity with water.